Being a Brit the toughest thing about reading Just Like That was understanding some of the slang used in the novel. However, it wasn't a major hurdle and once I'd gotten used to it things flowed a little faster for me. Just Like That is a pretty straightforward novel and comes across more like a biography. As Les points out in his forward 80% of it is based on fact so that is perhaps unsurprising. It’s exceptionally well written and whilst you understand that it’s at least part autobiographical you are entertained by the fiction of it too. It was enlightening and depressing for me to discover how brutal the American penal system used to be and perhaps still is. 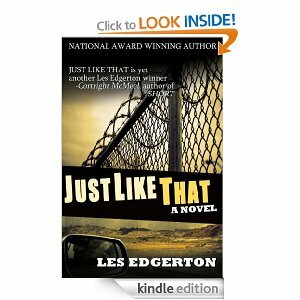 Les gives us insight into the criminal mind and was brutally frank about the fears and problems inmates face on a daily basis. It's clear that society's problems run deeper than we all understand and no slick talking politician's tough stance on crime will ever provide an all encompassing solution. I don't know if I should use the word "enjoy" in the context of the subject matter of this novel but the author's openness and ever present humour made the tough subject matter much easier to swallow. I've been lucky enough to chat to the author and I can tell you he's as open and candid as this book suggests. His humour is as disarming as it is in the novel. An excellent read that will remain with me every time I see a prison film. I'll be thinking It's NOT Just Like That. Thank you so much, Darren. Just glad you liked it, mate!